The Tanner Lectures on Human Values, founded July 1, 1978, at Clare Hall, Cambridge University, was established by the American scholar, industrialist, and philanthropist Obert Clark Tanner. Lectureships are awarded to outstanding scholars or leaders in broadly defined fields of human values, and transcend ethnic, national, religious, or ideological distinctions. 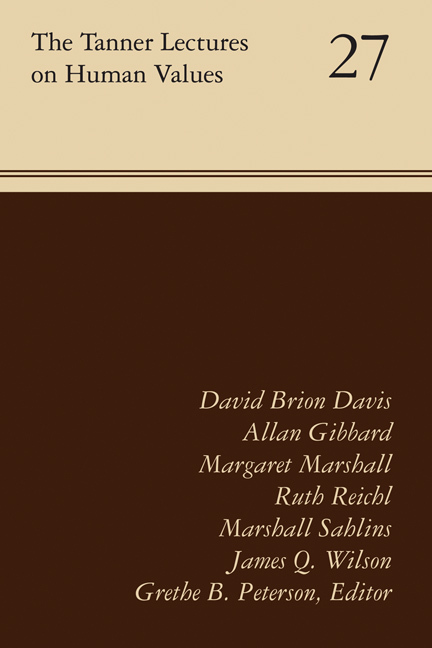 Volume 27 features lectures given by Ruth Reichl, James Q. Wilson, Marshall Sahlins, David Brion Davis, Allan Gibbard, and Margaret H. Marshall.